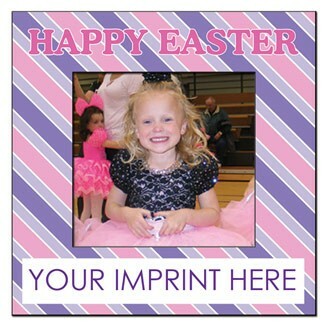 Happy Easter photo frame, 5" x 5", with die cut window size of 3" x 2 7/8". Liquid laminated for a high gloss finish. USA made. Made from heavy high density white paper board. Quick turn, just ask. Includes preprinted stock graphics. Your custom message or logo displays prominently at the bottom of the frame. An ideal promotional product sure to be enjoyed year after year. Note :Price includes pre-printed graphics on front plus one color imprint on back. PMS Color Match : $15.00(V) per color. Offset printed standard ink color, no charge. Die Cut Window Size: 3" x 2 7/8"